Note: A few of you have mentioned that the correct spelling for Prata should be PARATHA, as the wrappers in the photo below are spelled. Yes, that should be the correct spelling. But from where OCT and I come from, people usually just refer to it as Prata. Hence the title I've given this dog and my entry. 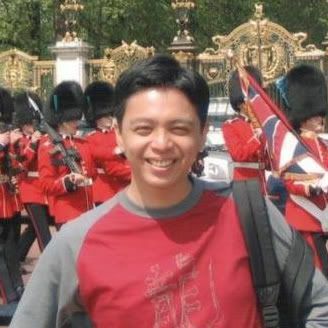 If anyone know how the A and H got omitted from Singapore's version, please let me know. Yesterday's Martha Stewart Show was all about hot dog , I couldn't help developed a sudden hankering for hot dog after watching the show. While the Ditch Dog sounds intriguingly delicious, it wasn't something I want to make just for myself on an uneventful weeknight. Just then, I remember the unique "dog" I've seen on my friend- Happy Home Baking's blog not long ago. 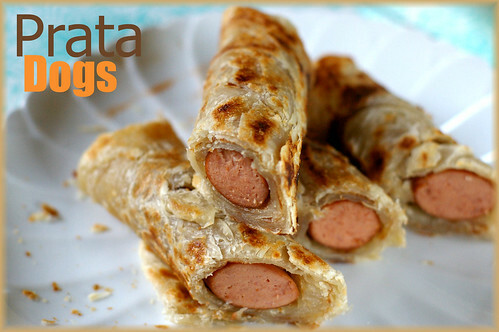 Insteads of using the traditional hot dog bun, the sausage is wrapped inside a prata (or roti Paratha), making it a Prata Dog (or Paratha Dog). For the uninitiated, Prata is a kind of flatbread enjoyed throughout Singapore and Malaysia. Conventionally, it is served along with curry sauce, although I like to just simply pan fry and snack on it when I am too lazy to make lunch/dinner. Eating a piece of prata is like eating a chewy piece of puff pastry. I wish I could give you a succinct description on the unique texture of prata, on how flakiness and chewiness coexist in a simple piece of flatbread; unfortunately it's beyond my realm now. However, I strongly encourage you to grab a pack of frozen prata the next time you visit the Asian grocery store. They are located at the freezer section, alongside the frozen chinese buns. They make a great snack anytime of the day and would be a great vehicle for hearty curry sauce. I think prata will be perfect served with this too. Moving on to the prata dogs. The process couldn't be more simpler. First, have your sausage cooked, whichever way you like. Let it cool for a few minutes. 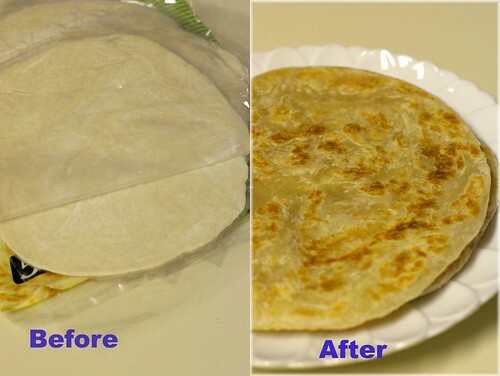 Next, take out the frozen prata from the freezer, and cook according to the instruction at the back of the package. Which basically means, heat a skillet to medium heat, and drop the frozen prata onto the hot skillet and let cook for 1.5 minutes per side. No thawing required. And no oil needed too. Isn't that neat? Once the prata is cooked, just wrap a sausage inside ,cut a few slits on top (which is optional) and bake for 5 minutes @ 350F. Serve with ketchup, mustard, hot sauce or even BBQ sauce and enjoy. Or better still, squirt in the sauce on the sausage before rolling up on the prata skin. I need to try this next time. They look yummy, however the flat bread photographs shown are that of 'Paratha', which is an Indian flat bread. This looks delicious! When I saw the picture I thought it was puff pastry, but prata actually sounds much more interesting! I think I would prefer that to a normal hot dog! Looks good but I'm not sure it would satisfy my craving. When I crave I usually have to go for something classic or I just keep wanting more.....bad sign, I'm sure! Here in out TV they only shows the martha show which is atleast 1 year old. This prata dogs looks so gelicious. Great creation! These look fun to make and eat! Oh, these are going to be a hit here - my brother and sister will love them! These look so good!! I've never had prata before. There is not an Asian market close, but next time I run across one, I'm going to be looking for prata so I can make these! Yum!!! I didn't know you could buy these in the store I will look for them. This is a great idea! But just FYI: a paratha is a very important part of sout, and south asian cuisine. it was taken to Malaysia when South Indians moved there in droves mostly for trading purposes waaay back in the day. 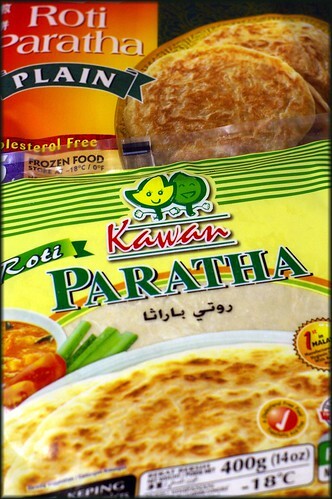 And the Malaysian parathas you find frozen are AWESOME. But please, please, would you listen to the slightly neurotic pedantic person in me and spell is like the label does? P-A-R-A-T-H-A. 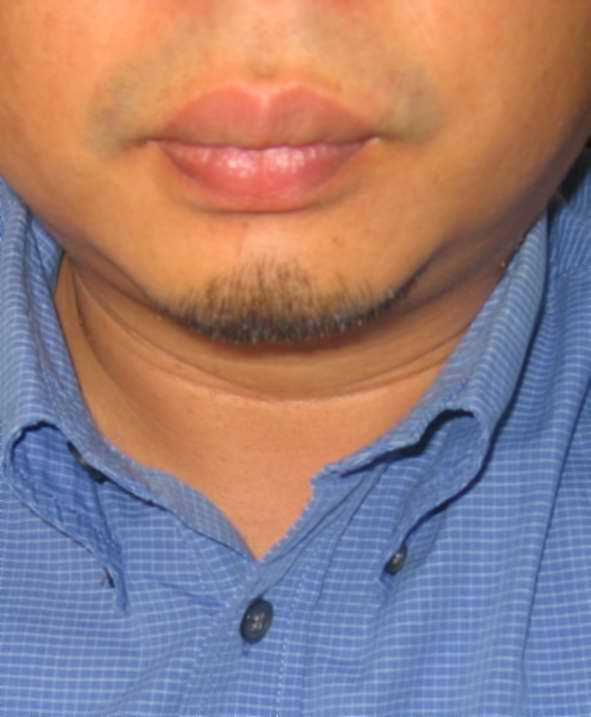 (The T is aspirated and so the h performs a very important liguistic function here). I know, I know. It's a minor, minor thing, but it hurts my ears. Just like someone said... these in Malaysia are AWESOME. When I was living there I bought them every week. Funny thing is that I also did something just like this recipe suggests and wrapped them around hotdogs... But, I later got in trouble for it because in Malaysia its a muslim food, and it offended some others that I was eating it with pork. I was living in a furnished apartment and the cleaning lady noticed. Well the next day after work I came home and all the cooking supplies were gone! Pots, pans, everything! I found out they didn't want me cooking pork with their things. Well, I can respect that, but they also didn't like me eating prathas with pork hot dogs... oh man! You're so creative. I have never thought this is possible! this sounds incredibly delicious. I fancy myself eating a couple of these! That looks like a super quick and easy meal. My kids would love it! hi mandy, FABULOUS stuff you have here!!! do you have any roots in my part of the world? 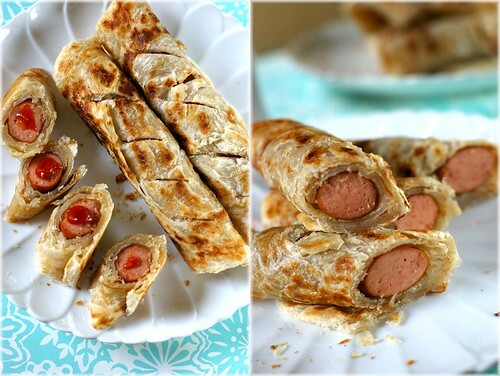 (SE Asia) what a brilliant idea, i am gonna try these prata dogs....maybe with fresh roti canai. What a fun way to do hot dogs! I am so craving that right now! they looks so yummy and perfect as appetizers at a dinner party! I have been seeing this around lately! Boy, they really look good.. I'm abit fearful of the calories though!!! sure! I hope you like this unusual dog!Let me know what you think after you try it! Great minds think alike. Although i must add that this genius idea doesn't come from me. On the other hand,I didn;t know that pork hotdogs are available in Malaysia! I know what you mean....that's why I only made three. One for me, two for hubs. thanks! I wish I could share a piece with everyone! HIHI i first saw this pic on Flickr. Then realised you have a food blog and then realised you are a follower of HHP blog, which I also frequent! We all love Pratas here in Singapore. We do eat it on its own, with egg beaten in it (mixed with raw dough then pan fried) and dipped with sugar or curry. It tastes fantastic! Delicious looking and delicious tasting and quite simple to make! I've never made this before. This is pure delight and I'm sure to make them again. This is a brilliant idea! I use frozen roti prata ALL the time (I'm Malaysian, and it's the closest thing I can get in Australia!) that is made right at home :) I can only imagine that this would taste really delicious.